There are some valid criticisms in the book and Livingstone is to be properly praised for them. He certainly straightens out certain issues that needed to be elucidated in Horne’s very long five volume series. But when one adds up the ratio of good criticism to everything else in the volume, it is not a very good batting average, writes Jim DiEugenio. 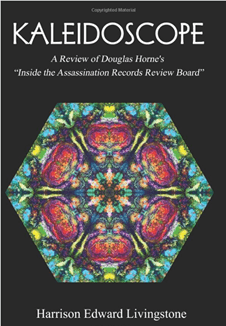 Kaleidoscope: A Review of Douglas Horne’s “Inside the Assassination Records Review Board”. The word ‘kaleidoscope’ refers to a cylinder that reflects colorful patterns reflected off of mirrors. That word derives from three ancient Greek words which, when combined translate as: looking at things of beauty. That title is a misnomer for there is nothing very pretty, let alone beautiful, about this book. There are some valid criticisms in the book and Livingstone is to be properly praised for them. He certainly straightens out certain issues that needed to be elucidated in Horne’s very long five volume series. But when one adds up the ratio of good criticism to everything else in the volume, it is not a very good batting average. On page 1 of Kaleiodoscope, Livingstone writes, “I’m not used to writing like this….” And its clear from there on that Livingstone never did the preparation that proper criticism entails. Especially if it’s a book length endeavor. It’s not like he didn’t have the time. After all, Horne’s series came out in 2009. Granted, the entire series comes to about 1,800 pages, but between reading, taking notes and filing, that still left him enough time to study exactly what it was he was supposed to be doing. I could easily have added a dozen more examples. I do not recall seeing anything like this vituperative display since reviews of Vincent Bugliosi’s Reclaiming History. There is nothing wrong in evaluating a book negatively, or in evaluating it and deductively saying something about the author’s ’s intent or personality. But what Livingstone does here can be fairly called self-indulgent. It is so far outside the realms of criticism that it becomes strange and bewildering. In the end, it vitiates the things of value in his book. If Livingstone had limited his personal attacks to just Horne and Lifton, that would be one thing, but he doesn’t. As long as I have known Livingstone he has always believed in a Texas based type of conspiracy. As time went on, and he had trouble convincing people of his theory, he decided to resort to unusual measures. So in 1993 he published Killing the Truth: Deceit and Deception in the JFK Case, which was a rather curious effort. As the estimable Martin Hay has stated, this volume qualifies as one of the ten worst books ever written on the JFK case. Up until then, Livingstone had gained some stature through his first two efforts, High Treason: The Assassination of JFK & the Case for Conspiracy and High Treason 2: The Great Cover-Up The Assassination of President John F. Kennedy. (The first was a co-venture with Bob Groden.) But Killing the Truth was an over-the top pastiche. Livingstone did two things to sell his “Texas Plot”. First, he used an unnamed personage who told him just how the Texans had done it. Livingstone called this person “The Source”. If you are going to make an invisible entity the basis for the spine of the book – your inside story on how the assassination happened – then what worth is it to have he or she remain nameless? Well, though Mary Ferrell is dead, her ghost survives for Livingstone. Today, her pernicious influence lives on through the Mary Ferrell Foundation. The problem with this is that, the MFF is an online entity and has nothing to do with Texas politics, then or now. Before she died, a venture capitalist entrepreneur in the high tech field purchased her book and file collection. He then enlisted Rex Bradford to create a database for thousands of scanned materials to be stored on a Foundation website, accessible to anyone. The MFF, through Rex and several Directors, created the website and realized a goal for Ferrell. As of today the MFF has also digitized the HSCA volumes, the Warren Commission volumes and documents, and files from the Garrison investigation. The Foundation owner was to use some of this high tech equipment to find patterns and leads in the case but it is not known if this was accomplished. Why do I bring this up?Because, according to Livingstone, somehow the Mary Ferrell Foundation was a sinister influence on Horne and his work. Livingstone frowns on “anyone having anything to do with anything connected to Mary Ferrell” who “although dead, remains a great threat to the rest of us….” Now, if Mary is dead, and her files, among with many, many others are digitized so they can be readily available to anyone, then how is this a bad thing? Further, how does this have anything to do with Horne’s Inside the ARRB, which is supposed to be what Kaleidoscope is about? 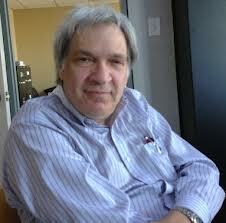 According to Livingstone, either Mary Ferrell or the MFF has given tens of thousands of dollars to David Lifton. It’s hard to decipher which one. It may be both. Livingstone goes even further by claiming Lifton was probably then loan sharking money to Horne. And, this is how, I guess, the ghost of Mary Ferrell somehow negatively influenced Horne’s series of books. David Lifton at the Los Angeles ARRB meeting. When I read these accusations I decided to get in contact with Rex Bradford. Rex runs the day-to-day operations of the foundation. He is essentially the Director there and has been for the last few years. I asked Rex what he did for Horne as far as his books went. He replied that he helped Doug with some technical aspects of getting files ready for printing; he aided him in setting up an account at a print on demand book publisher; MFF offers the book for sale (as he does other books); and he has some of Doug’s exhibits for the book at the site. He stressed that, bottom line, Horne self-published the book and that Doug sells it at other venues, like Amazon. Rex also added that the assistance he gave to Horne was at no cost. So after listing all this information, which you will not find in Livingstone’s book, where is the influence on Horne of Mary Ferrell and her rightwing cronies – the Dallas money people – who hated Kennedy so much? Especially since it is now nine years after her death, and the foundation is headquartered today in Massachusetts, home of the Kennedy clan. I also got in contact with David Lifton about this issue. He assured me that he never got any funds from Mary Ferrell for the writing of Best Evidence In fact, prior to that book’s publication, he had only met Mary once. This meeting was in Los Angeles, not Dallas, and she was with the New York based writer-researcher Sylvia Meagher. Mary and Sylvia both gave him a rather small amount of money since he was going to Washington to copy some documents from the National Archives. The money was to secure copies of what he was getting for them. This was in the mid sixties. He did not meet Mary again until after his book was published. Lifton states that his parents supported him in his literary efforts until a contract was awarded to him in late 1978. His manuscript was tendered in 1980. He then met Mary Ferrell for the second time in 1981, after the publication date. All of this leaves Livingstone’s accusations about Lifton being able to “plant the craziness of Dallas via the Mary Ferrell circle of dangerous lunatics…to co-opt us and the nation with their Right Wing dogma – and cover-up or ruin the conspiracy evidence….” through “his minion” Horne, it leaves this all a bit, well, tenuous. If Lifton met Ferrell once before the book was published – and this was in California with Sylvia Meagher – how then could she have exercised such sinister Texan influence on him? How could Ferrell’s “influence” then be transferred to Horne? Ferrell was known for her great attention to detail and her collection of early government documents on the assassination. It is more probable that Lifton would have stayed in contact with her (and her resources) to enhance his own studies as he has been writing a new book on Lee Oswald for decades. Surely, later in the 1990’s, while working for the Assassination Records Review Board, Horne was guided on where to look for possible records to push for release. After all, that was his job with the ARRB. Several times in the book Livingstone states that the financial support for Horne was granted through monies supplied by the MFF to Lifton, who then recycled it to Horne. In another communication from Bradford, he wrote that the Mary Ferrell Foundation is not in the habit of granting subsidies or loans to authors and to his knowledge, which extends back to 2005, none was given to Lifton. But despite all of these denials, Livingstone writes later on near the end of the book that one of Horne’s serious problems is the “bad company” he fell in with. He then writes that, “He needs to accept that the JFK “Research Community” is corrupt and that he was corrupted by it.”How did this happen? “Lifton’s task was to catch this fish and reel him in and turn him over to the tender mercies of the Ferrell/Conway crowd, the corrupt and betraying Gary Mack and Jim Marrs set and most of the rest of the Dallas people whose hands he is in now.” Again, this is puzzling, on several counts. “Conway”, I assume is Debra Conway, who owns and manages JFK Lancer. I asked Debra if she had anything to do with Horne’s book. She replied she did not. Besides Horne speaking at her Dallas conference twice, she has had little or nothing to do with Horne’s career in the research community. In a later conversation, Conway stated Ferrell had no control over any MFF funds and could not have directed a loan be given to anyone. Also, I don’t understand how Livingstone could call something in Dallas the “Gary Mack and Jim Marrs set”. Many years ago, Marrs used to be friends with Gary Mack. But once Mack flipped sides and started working for the Sixth Floor, their relationship faded away. Today, Jim is a fierce critic of both Gary Mack and his employer The Sixth Floor Museum. Finally, Mary has been dead for a decade, with her book and file collection long transferred to Massachusetts. During her time in the research community, Ferrell readily admitted she first began researching the JFK assassination because, as she would say, “Somebody I know [in Dallas] might be involved!”. This was no secret or avoidance of a Dallas plot. So, after all this review, just where is the Dallas influence on Horne that Livingstone finds so repugnant and bracing? I spend some time on this because, first of all, I think its necessary to show Livingstone’s failings as a critic. If one is going to be negative and personal in the discussion, then one had better be doing so on solid, relevant grounds. As the reader can see, this part of the book is, to be gentle, a misfire in that regard. But secondly, I think it is important in order to show how untidy Livingstone’s mental discipline is in his building a conspiratorial construct. It would appear to me that the author has reasoned here deductively. He buys into this Texas based plot. Therefore all the perceived evil in the research community must also emanate from Texas. The details are not important; the postulate must be upheld. As we will see, this untidiness also is present in his model of the JFK conspiracy. And I should add, if a writer/investigator cannot put together a rather small group of accessible people, of average means and position into a credible conspiracy model, then why should we trust him to construct a larger network of largely inaccessible people of much greater wealth and power with the ability to conceal their acts? Before leaving Livingstone’s peculiar take on Horne, and his place in the research community, its necessary to note the complement to the author’s rather derogatory and demeaning portrait of that small, investigatory circle. (And without detailing all of it. Other people are also dealt with rather coarsely e.g. Gary Aguilar, Harold Weisberg, Chuck Marler and Jim Marrs.) The complement to this rather unseemly picture is the author’s penchant at self-levitation. That is, to elevate his position in the field. He does this in more than one way. He says, for example, that a distinguished ad hoc committee of professors first asked him to work on the case. This included a dean from Harvard and a professor from MIT. These men all knew the author and thought he could crack the case. So I decided to talk to Bob Groden about this point. Groden was the co-author of Livingstone’s first book High Treason. When I emailed Groden about this point, he told me that during the whole time they worked on High Treason together, Livingstone never said a word about such a committee enlisting him into such an endeavor. Livingstone then implies – it’s hard to decipher his grammar at times – that he was elevated to the faculty at Harvard, without a degree. Livingstone does something odd in this particular discussion. After saying that he was “elevated to the faculty without a degree” he compares himself to Henry Kissinger in that distinction. But Kissinger first graduated from Harvard in 1950. He later graduated with a Ph. D. in 1954. It was then that Kissinger joined the Harvard faculty. Livingstone also says that another reason he began his JFK studies was from personal communications with Jackie Kennedy and Ted Kennedy. In his words, “Jackie messaged me through her assistant at Doubleday that the photos were false, as did Senator Edward Kennedy through his Secret Service guard, John Libonati”. It would be nice to see some certification of this. Because, as most people know, the Kennedy family was very tight lipped about their feelings in this area. That is, until Robert Kennedy Jr. broke the silence in an interview with Charlie Rose. According to Livingstone, “I was completely responsible for drawing Dr. [David] Mantik into the entire issue. 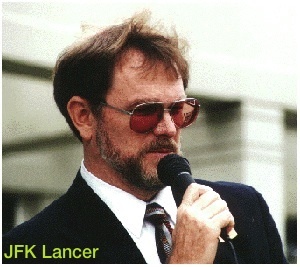 David Mantik, M.D., Ph.D., who has made many valuable contributions to the JFK case, especially in the medical field, received his doctorate in physics and practices medicine as a Radiation Oncologist, Since his day job is to examine X-rays, he has done some very important work in that specific area. When I emailed Mantik about this claim he said that what first interested him in the JFK case was watching Oliver Stone’s film back in 1991. After that he picked up Best Evidence, and High Treason and Dr. Charles Crenshaw’s book, since those volumes contained visual depictions and lengthy discussions of the medical evidence. From there he was on his way. Nurse Diana Bowron was at Parkland Hospital when President Kennedy was brought there after he was shot. No writer interviewed her for many, many years afterward. To my knowledge Livingstone was the first. According to him, this was not accomplished by simple location work by him and Bowron’s consent. According to the author, “the British government and police chose me and no one else to talk to her. It was a surprise when they called me out of the blue.” It would be nice to see some corroboration for this claim. For instance, a letter, a fax perhaps, a diary entry from across the pond, as to why it was Livingstone who was deemed so worthy. Sharing more, Harrison writes, “I had an entire radiology department somewhat at my disposal for years….” He claims that the Baltimore City Police Department donated a team of five men to him. He writes that this happened because major cities in the USA had no trust in Dallas “after the assassination and were running operations on the filthy town.” According to Livingstone, millions of people have read his books on the case. He got so famous, that the fame began to wreck him so he had to leave the country. Then, at the end, he writes that, at times, he has had an investigative team numbering nearly a hundred people ”spanning the nation.” Then, on the very last page, the crescendo is reached: “He is considered by many the principal researcher, investigator and writer in the case.” Well, as we have seen, Martin Hay does not think so. And if Livingstone was considered as such, would he not have been invited to speak at conferences held by Doug Carlson in Chicago, John Judge and COPA in Washington, Debra Conway and Lancer in Dallas, or Cyril Wecht at Duquesne in Pittsburgh?To my knowledge, he has been invited to speak at none of them. This marked characteristic of Livingstone’s, the tendency to elevate himself, and to denigrate others is one I cannot recall in any other writer in the field. Certainly not to the extent exhibited by him. And some of the work that Livingstone tries to promote in the pages of Kaleidoscope would certainly seem to detract from that claim. For instance, he writes early on that Governor John Connally was hit in the back at Zapruder film frames 285-86. He adds that this is quite clear in the slides made from the film at Life magazine. I do not recall anyone postulating such a late hit on Connally. Most people I know think it took place much earlier. But further, Livingstone states “he was also hit by a shooter in front of the car.” In looking at still frames from the film, this does not seem possible. Since Connally is rotated to the right at these frames, a shot from the knoll area would have hit Connally in the chest. And we know that he was hit in the back. A shot in the back at this point – with Connally turned around at perhaps more than ninety degrees to his right – would seem to originate from the other side of Dealey Plaza. And it appears that Nellie Connally would have been in the line of fire. Livingstone also says that he has found the “secret FBI reports” based on the so-called film of the “Babushka Lady”. This was the young woman in a light coat and headscarf filming the motorcade in Dealey Plaza. The Abraham Zapruder film shows she is holding some kind of camera as she is positioned on the grass opposite and across Elm Street from Zapruder. Her film has never been adduced. So for Livingstone to say that he found a reference to it in “secret FBI reports” is an odd claim. In an earlier book of his, Killing Kennedy, Livingstone sourced his “secret FBI reports” to Commission Document 298. I don’t understand how an FBI report can be secret if it appears in a Warren Commission appendix. When one finds the CD, one will see a reference to a film by Orville Nix. Livingstone says that since this film is not represented accurately by the FBI, then the Bureau switched the Nix film with the Babushka Lady’s film. Yet, in this same CD the FBI also misrepresents the Zapruder film. So this seems to me to be something of a stretch. Especially since there is nothing in the FBI reference he uses that would necessitate not producing the film or the name of its owner. Some of Livingstone’s other claims also seem like a stretch. He writes that Jackie Kennedy seems to be painted into the Zapruder film. I assume he means her entire body. But he does not elaborate on this at all, as to the why or how. Dealing more with his suspicions about Zapruder film alteration, he writes that the presidential limousine was fired upon while it turned from Houston to Elm Street. No one I know of, besides perhaps Max Holland, thinks a shot occurred this early. Livingstone writes that there was only “some” military control at the autopsy. This would seem to be contradicted by Kennedy pathologist Pierre Finck’s landmark testimony at the Clay Shaw trial. There, Finck seemed to indicate a lot of direct control by the military. So much so that the Justice Department panicked and wanted to bring down fellow Kennedy pathologist Thornton Boswell to discredit Finck. To this day, Livingstone insists that, because the anterior and right lateral x rays are extremely dark on the right, frontside of JFK’s skull, this indicates a blow out to the right side of Kennedy’s face. And since the photos don’t show this, then something drastic is wrong with the pictures. This reveals that Livingstone is not all that familiar with Mantik’s work. In 2003, Mantik cooperated with Cyril Wecht on a long, profusely illustrated essay about the x rays. This fascinating essay partly addressed this specific issue. Both doctors came to the conclusion that although laymen could deduce that the darkness indicated a lack of skull bone, physicians understood this actually indicated a lack of brain tissue. This essay was written and published ten years ago.It’s hard to believe that, in the ensuing decade, Livingstone was never made aware of its existence. Especially since it concerns a pet interest of his. There is another relatively recent development in the field the author does not seem aware of. And again, it relates to an area of his special interest. In this case, his suspicion that the Zapruder film has been seriously altered. This is the so-called Full Flush Left (ffl) argument. This was the idea that since picture frames of the Zapruder film spilled over into the intersprocket area of the film, that this somehow indicated the actual original film had been copied, or else it would not align that way. This idea had always been disputed by even those who thought the film was altered, e.g. John Costella. In my review of Horne’s series, I addressed this specific issue at length. I noted that Bob Groden wrote to me that using the proper optical printing equipment, doing one frame at a time, this would not happen anyway. Secondly, Josiah Thompson posted at Spartacus Educational back in 2009 that Kodak expert Roland Zavada did produce frames where this effect did appear. 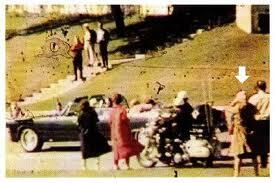 Further, researcher Rick Janowitz conducted an experiment with the same type of camera that Zapruder used that day. In his experiment he discovered that you could attain continuous ffl alignment with that camera. Frames from this experiment were placed online at Spartacus by Craig Lamson in January of 2010, at least two years before Kaleidoscope was published. So for Livingstone to argue here, as he does, that Horne did not give him enough credit for the discovery of ffl is weird. One wonders why Livingstone would want to criticize Horne about not crediting him with a now specious argument concerning Zapruder film forgery. Again, this discovery has been online for years, and I dealt with it in my own critique of Horne’s book. It is hard to comprehend why Livingstone would not read a previous lengthy review of Horne before he went ahead and wrote his own. This would indicate a fault in his preparation for this assignment. If criticism entails anything, it entails the practice of being fastidious. That is showing a demanding and excessive delicacy about facts, being meticulous in one’s standards of scholarship. The reason for this is obvious. If you do not display this quality in your own work, how can you be trusted to do so in relation to the work of others? Late in the book, when discussing Horne’s last volume which deals with a macroscopic view of Kennedy’s assassination, Livingstone writes about Eisenhower’s famous Farewell Address where he warned about the evolving threat of the military industrial complex. Apparently, in his attempt to insinuate Texas into the speech, he writes there that, “It was Texas oil men who bought President Eisenhower’s farm for him near Gettysburg, a good place for Ike to retire, but he knew what they were trying to do to him.” It would be nice to see something like this footnoted, because to anyone who knows anything about Eisenhower it makes no sense. Eisenhower and his wife purchased their Gettysburg property in 1950, while he was president of Columbia University. He was earning a fairly good salary there. Since the purchase price was only $40,000, I don’t think he needed any personal favors from Texas oil men. Especially in light of the fact that two years earlier, Eisenhower had published his military memoir, Crusade in Europe. Just the advance on this book was worth well over a half million dollars. So why would he need to borrow less than a tenth of that for his home? Further, as Blanche Wiesen Cook notes in The Declassified Eisenhower, it was while he was at Columbia that Eisenhower began his studies within the Council on Foreign Relations. He especially studied in economics, and how America could influence Europe through the Marshall Plan. Therefore it would appear that it was the CFR who influenced his worldview, not H. L. Hunt. This is a good lead into Livingstone’s direct criticism of Horne. As mentioned, in the last volume of his series, Horne tried to put together a “Big Picture” view of the Kennedy assassination. Generally speaking, this meant why was Kennedy killed and who did it. In my review, I found this part of Inside the ARRB to be rather disappointing. For the specific reasons that I did not think Horne’s view of Kennedy was very sophisticated, and I also thought that some of the sources Horne used for his ideas on who killed JFK were not really sound or credible. Livingstone disagrees with me. He thinks that this is the best part of the series. In reading what he says, I think it’s because first, Horne allows for a Texas-based component as part of the plot; and second, Livingstone’s view of Kennedy is as superficial and unenlightening as Horne’s. February 28, 1962. 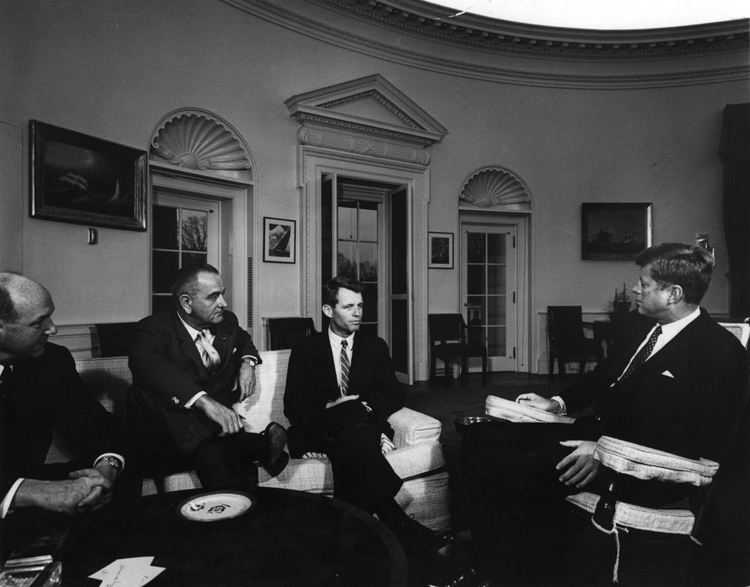 At around 5:50 PM JFK met with RFK, Dean Rusk, and LBJ in the Oval Office after RFK returned from a trip to Asia. For instance, Livingstone, quoting Horne, agrees that the Kennedy who was killed in 1963 was a substantially different man than the one who entered office in 1961. It’s not exactly clear, but the source for this seems to be former Senator Gary Hart. I like Hart, and voted for him. But I never regarded him as a foremost expert on President Kennedy. And I don’t know why Horne or Livingstone do. There is no doubt that the Bay of Pigs made Kennedy more antagonistic toward the CIA. And the Missile Crisis made him more anxious to hasten a détente with Cuba and the USSR. But to say that the Kennedy who entered office in 1961 was somehow a “Cold Warrior”, this is simply wrong. Because it does not explain why he did what he did his first year in office in places like Congo, Vietnam, Indonesia and Laos. And why, when the Bay of Pigs was failing, he refused to authorize the use of American naval power. Which is what Allen Dulles thought he would do. And, in fact, Dulles was banking on that happening. Further, if one is not aware of Kennedy’s evolving view of colonialism in the Third World, then one cannot understand why Kennedy refused to authorize the issuance of combat troops into Vietnam in the fall of 1961. Or why, after the Bay of Pigs failed, Kennedy authorized a White House inquiry into what actually happened. Nor can one understand why and how the Henry Luce controlled Fortune magazine, then hit back at Kennedy for firing Allen Dulles with a ghost written article penned by Howard Hunt. A man’s character and judgment is not molded once he reaches the White House. In large part, it is forged years before he passes through those doors. But in addition to this less than complete examination of who Kennedy was, Livingstone then goes along with some of Horne’s most dubious sources in his final book. For instance, Horne relied on the now infamous party at the Murchisons the night before the assassination. And it appeared that Horne used Killing the Truth for some of this. So Horne had to, at least partly, rely on Madeleine Brown. Well, Livingstone is not going to score Horne for using his own book of course. And further since he edited and published Brown’s book, she is fine with him also. Because Brown backed the idea of an LBJ plot, Livingstone backed the idea that she was the mother of Johnson’s illegitimate son. In fact, Steven Brown filed a 10 million dollar lawsuit against Lady Bird Johnson in 1987, which was 14 years after LBJ had died. The lawsuit was dismissed about two years after it was filed because of Steven Brown’s failure to appear in court. Why did he fail to appear in court? Probably because he had filed another lawsuit seven years earlier saying that attorney Jerome Ragsdale, not LBJ, was his father!Its not a very good paternity case when you and your mother cannot decide whom the real father is. Yet, both Livingstone and Horne backed this woman. As with Estes and author Barr McClellan, Livingstone claims that Johnson was a serial killer. When you use sources like Barr McClellan and Estes, yes you can make fantastic claims of homicide. But then you have to come clean with the problems with those two witnesses. Which, neither Horne nor Livingstone do. And when Livingstone writes on page 415 that “There is strong evidence that Johnson actually ordered Kennedy’s killing….”, that bombastic claim is not footnoted. Then, a paragraph later, he uses Billy Sol Estes to seem to back this up. But then how solid can the indictment be?The answer is: not very. What is Livingstone’s ultimate solution to who killed Kennedy?He says it was a consortium of elements from the power structure of America. He actually names the Texas oilmen, LBJ, the CIA, the Pentagon, the Wall Street bankers. This group then hired Secret Service agents and the FBI. Sounds a bit like that famous fantasy the Torbitt Document. Unfortunately, assassination plots are not Agatha Christie novels, e.g. Murder on The Orient Express.As I have always maintained, if everyone killed Kennedy, then no one did. We might as well say that Oswald did it because that “everybody did it claim” is as credible as the Warren Commission. Livingstone himself comes close to admitting this when he mentions Secret Service agent Abraham Bolden’s Chicago Plot. He writes that, in light of this, “it would appear that some of the planners could operate on a national level.” But if the Chicago plot had succeeded, would writers like Livingstone then have posited an “Illinois Conspiracy”? Livingstone endorses Horne’s use of a questionable declassified document. On page 1492 of Volume 5 of Inside the ARRB, Horne prints a subheading, “The KGB Fingers LBJ: The Ultimate ‘Smoking Gun’ document.”Horne implies the ultimate source is a KGB document. Again, Livingstone says that he also deserves credit for this document since he noted it in High Treason. In my review of Horne, I did not mention this alleged KGB report which he declared was such a bombshell. Why? First of all, it’s not a report, and second, the KGB did not write it. This is an FBI memorandum and the title is “Reaction of Soviet and Communist Party Officials to the Assassination of President John F. Kennedy.” The memo is a compilation of Russian and communist sources about the reaction to Kennedy’s murder. Some of the information compiled is actually from the Soviet press. Some of it is not even from Russian sources. It is from Marxist sources in the USA, like Gus Hall and The Worker. The document does source Yuri Nosenko, the KGB defector, but his information is simply about Oswald’s time in the USSR. The closest the memo comes to saying what Livingstone and Horne says it does is that “now” the FBI has a source that says the KGB has information that indicates LBJ was responsible for the assassination of Kennedy. The “now” is December 1, 1966, since the memo was written then. The memo does not name the source of the information, or what the information actually was, what it specifically says, or how the Russians got it. Therefore what is its forensic worth? Realizing this is a problem, Horne and Livingstone say that the document was sent to LBJ as a threat to help Hoover keep his job. In other words, it was one of Hoover’s methods of wielding power over Johnson. The problem with this is that most people understand that since LBJ and Hoover were pals, there really was not much of a threat of Hoover being fired. Allowing for that,in December of 1966, the first wave of critical books and articles were now making an impact in America. This memo appears to be a way to keep tabs on what the communist world abroad was thinking on the subject. Since it was now an issue that could not be avoided. Anyone who can call this memo a smoking gun has questionable powers of textual analysis and evidence evaluation. There is another document which Horne very much played up in his book as being another smoking gun. This one was used to back the idea that Kennedy’s body was not really being transferred to Bethesda Medical Center by Bobby and Jackie Kennedy as millions watched on television as they drove across Washington. That particular casket was empty. The body was actually entered into Bethesda at 6:35 PM, not at the later, official time of seven o’clock. Horne referred to this document more than once throughout the book, and each time it was referenced as backing up David Lifton’s theory of body swiping and wound alteration. Horne referred to it as the Boyajian report. Roger Boyajian was a Marine Sgt. on duty at Bethesda on the 22nd. He led a small detail of men that day called the Honor Guard. 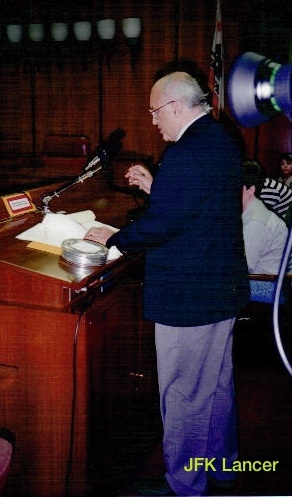 According to Horne, Boyajian wrote a report the next day that proves that it was his detail that actually brought in Kennedy’s casket at the earlier time of 6:35. Therefore Lifton and his body switching idea are upheld. In my review of Horne’s series, I did not mention Boyajian or his report. This was supposed to be dealt with by Gary Aguilar in another review of Horne’s series. Unfortunately Aguilar was going through a long and complicated divorce process that entailed him having to relocate. So he never got around to writing his review. Well, Livingstone deals with the issue at length here, and in my opinion he does a good job with it. It would appear that Horne oversold the document and Livingstone uses the opportunity to really pile onto Horne with a lot of invective. I wouldn’t go as far as he does in that regard but let us spell out some of the problems that the document has and that Horne did not elucidate very well. First, the actual report does not say that the casket picked up by Boyajian’s men was President Kennedy’s. In the one sentence that deals with the issue it is referred to only as “the casket”. As Livingstone properly notes, this is a serious fault with Horne’s claim. It is hard to believe that if Boyajian knew he was handling JFK’s casket, would he not write that down and specifically note that fact? Further, there is a real problem of authentication as this report is not signed by Boyajian and there is no trace in the record as to why he did not sign it. There is a second page to the report that lists the ten men in the detail – none of which signed the document either. What makes it all a bit worse is that when the ARRB questioned Boyajian about whether he recalled picking up Kennedy’s casket, Boyajian couldn’t recall doing so. In fact, he could not recall much at all about that day. And importantly, it does not appear that the report the ARRB had was the original document leading us to question as to whether or not that original was ever filed with the military. All of this seems strange if the casket really was Kennedy’s. Additionally, Livingstone shows, if one lives in the area, as he did, it is very hard to understand how Horne could buy into this idea without questions. After all, Horne did live in Washington while working for the ARRB. As Livingstone describes it, the route through downtown Washington from Andrews AFB to Bethesda is about 18 miles. But yet for the Boyajian report to say what Horne declares it says, somehow this transport traversed the 18 miles in about 20 minutes. Unless the driver was proceeding at a continuous 60 MPH on city streets, this does not seem possible. As Livingstone explains, Boyajian did not pick up Kennedy’s casket. Bethesda is also a morgue. It did not stop being so just because Kennedy was being transported there that day. Other military men died that day. After all, America was involved in a war. Livingstone interviewed several people who identified another person’s body being delivered to the morgue that day. There was no autopsy done and his body was being stored in the “Cold Room” for burial at Arlington. The weight of the evidence seems to dictate that it was this person’s body that Boyajian’s detail picked up. There are other good points that Livingstone develops to counter some of the excesses in Horne’s books. For instance, the issue of Roy Kellerman having blood on his shirt aboard Air Force One does not mean that Kellerman was somehow performing surgery on JFK’s body in a secret compartment. Kellerman helped get Kennedy’s body out of the limousine and onto a gurney at Parkland. 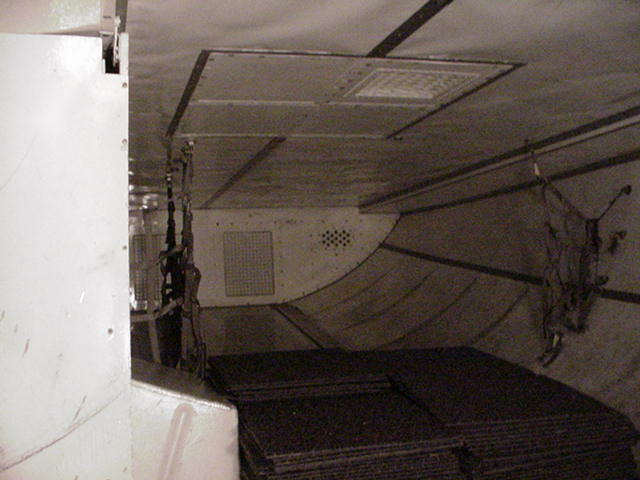 And concerning the alleged secret compartment, Livingstone supplies some good photos illustrating the work of James Sawa showing that there was “no trap door leading from the rear baggage compartment up to the rear of the aircraft.” This vitiates one of the earlier theories Lifton had about secret surgery on board Air Force One. When I reviewed Horne’s series, I concluded that he needed a tough-minded editor to reduce the size and scope of the book to highlight the good things he had done. Livingstone says the same about Horne. Yet he does not note the irony that this same criticism could be easily applied to Kaleidoscope. This book could effortlessly have been reduced in size by at least one half. Probably even more. And it would have been much more valuable and pointed. What is worse is Livingstone had a valuable model in front of him that he knew about – one that avoided all the conspiracy bantering about the JFK research community. The late Roger Feinman wrote The Signal and the Noise, a long critique of Best Evidence, back in the nineties. It was much shorter than Kaleidoscope. But Feinman avoided most of the pitfalls that Livingstone did not. Livingstone, who much admired Feinman’s work, seemed to forget what made Roger’s critique valuable when he wrote Kaleidoscope. Note: The author informs us that there is a newer edition of this book, however, it is not available as we put this article online. When a second edition is available, and if there are any substantive changes, we will do an update to this review. But the first edition has been out for five months and as of this writing is the only version available. Update: Since this review appeared, I have been alerted by researcher Martin Shackelford that there were three five figure loans for a total of $165,000 made to David Lifton by the Mary Ferrell Foundation. He saw these listed on the site. And they appeared before Rex Bradford became the director. Mr. Lifton has not replied to my queries about this subject, so I cannot pursue it further. Document reproduced p. 132; Livingstone's website.